Categories > Strength Protocols > Another weekend fun for our ice hockey coaches. Here an example what happened to Chara , Bergeron and many more top NHL penalty killer. Here what you look in the next few games. Look at the time they are on the ice and look where and how they most often loose the puck. Now here one possible explanation to a situation, where you often wonder why he was not able to simply lift the puck out of the zone. ??? The pictures shows a 3 load all out activity with the legs. Dark green SmO2 trend. as well a non involved upper body muscle in this activity delta pars acromialis. You can see three loads. Hint . You look at load time and recovery time as well as reaction of a non involved muscle and the recovery situation there. 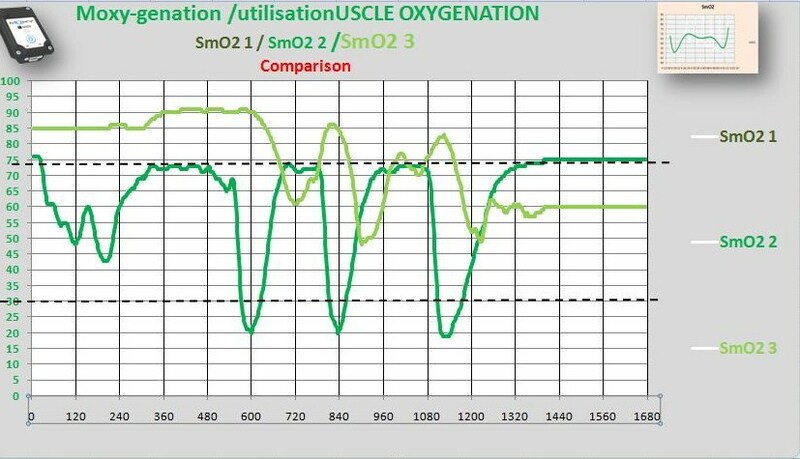 Now this is in simple terms just looking at the metabolic demand over the O2 utilization reactions. The other part we look is as well at the delivery reaction, where we compare THb and SmO2 with each other and with each body part. This information can nicely improve the decision of the coaches , whether it makes sense to get a player on the ice or not , as well gives the coaches the direction on what and how to work in the upcoming off season to get the players ready for next year.